Car paint has several peculiar characteristics. On top of the cars bodywork is a thin layer of pigment. The properties of this layer is such that the actual perceived color shifts depending on the viewing angle as well as the incident angle of the incoming light. Within this layer tiny metal flakes are suspended. The flakes reflect light and can be seen glittering on a sunny day, due to individual flakes reflecting sunlight directly at the observer. On top of this is a clearcoat layer, which can be more or less reflective and more or less glossy, depending on the quality of the layer and any added wax coating. Most notably, this layer tends to exhibit a pronounced Fresnel effect, reflecting more light at glancing angles. Diffuse reflection in the pigmentation layer, with selectable color shift due to observer as well as incident light angle. 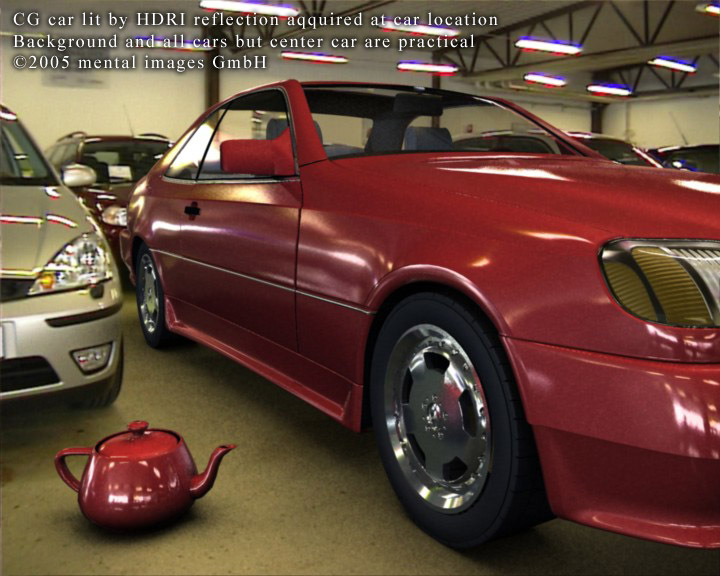 Includes a clearcoat layer with selectable mirror or glossy reflections and specular highlights with an optional "glazing" mode. Includes a lambertian dirt layer, for that "unwashed" look. is the ambient light component. Note that this parameter is treated differently to the ambient/ambience parameter pair of many other base shaders in that it is influenced by the other diffuse color parameters following, and hence represents incoming light, rather than the objects "ambient color". is the base diffuse color of the material. is the color seen at glancing angles (i.e. edges) which tend to appear much darker. For really deep metallic paints seen on sports cars it tends to be almost black. defines the falloff rate of the color towards the edge. The useful range is 0.0 to approximately 10.0, where the value 0.0 turns the effect off. Higher values makes the edge region narrower, lower values makes it wider. is the color seen in the area facing the lightsource. defines the falloff rate of the color towards the light. The useful range is 0.0 to approximately 10.0, where the value 0.0 turns the effect off. Higher values makes the colored region facing the light smaller/narrower, lower values makes it larger/wider. controls the overall level of the diffuse parameters. modifies the falloff of the diffuse shading. The useful range is approximately 0.5 to 2.0, where 1.0 represent standard lambertian shading, higher values pushes the diffuse peak towards the light source, and lower values flattens the diffuse peak. sets the influence of indirect light (photons and final gathering) on the surface. It is internally divided by PI, i.e. a value of 1.0 means the standard 1.0/PI weight. is the color of the primary specular highlight. is the color of the secondary specular highlight. enables a special mode on the primary specular highlight called glazing. By threasholding the specular highlight, it makes the surface appear more polished and shiny. For nice sportscars with a lot of wax, turn glazing on. For beat up cars in the junkyard, turn it off. is the color (reflectivity) of the flakes, which is generally white. is a scalar multiplier for the above color. defines the amount of ray traced reflection in the flakes, which allows glittery reflections of e.g. 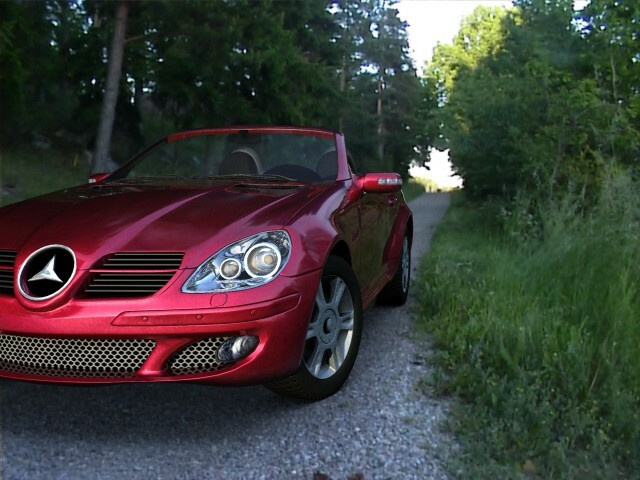 an HDRI environment. The value of 0.0 turns the effect off. The effect should generally be very subtle and a value of 0.1 is often enough. The final intensity of reflections also depends on flake_color and flake_weight. is the Phong specular exponent for the flakes. sets the density of the flakes. The useful range is from 0.1 to approximately 10.0, where lower values indicate less dense flakes and higher values indicates denser flakes. Since flakes are inherently small, they can easily introduce rendering artifacts if their visual density becomes significantly smaller than a pixel. If the oversampling of the rendering is set high, small flakes may also potentially trigger massive oversampling and hence very long render times needlessly, since the averaging caused by the oversampling will essentially cancel out the flake effect. To avoid this the parameter flake_decay exists. sets a distance at which the influence of flakes fade out. A value of 0.0 disables fading. Any positive value causes the flake_weight to be modulated such that is reaches zero at this distance. or trigger unnecessary oversampling and long render times (here rendered with low oversampling for illustrative purposes). Using flake decay. The flake strength diminishes by distance. The same intentionally low oversampling as in the previous image has been used. sets the difference between the orientation of the flakes. The useful range is 0.0 to 1.0 where 0.0 means that all flakes are parallel to the surface and higher values means the orientation of flakes are more and more varied. is the size of the flakes. The procedural texture is calculated in object space, and will hence follow the object. Keep in mind that the scale is therefore influenced by any scale transformation on the object instance. sets the color of the reflections in the clearcoat layer, generally white. Clearcoat tends to reflect more at glancing angles (edges). defines the "narrowness" of this edge. controls the reflective strength at the edge (generally 1.0). defines the reflective strength at facing angles (generally low, 0.1 - 0.3). Optionally, clearcoat layers may be glossy. samples parameter sets the bumber of glossy reflection rays traced. The value of 0 disables glossiness. sets the amount of glossiness. Cars are generally near-mirrors so this value should be kept small. 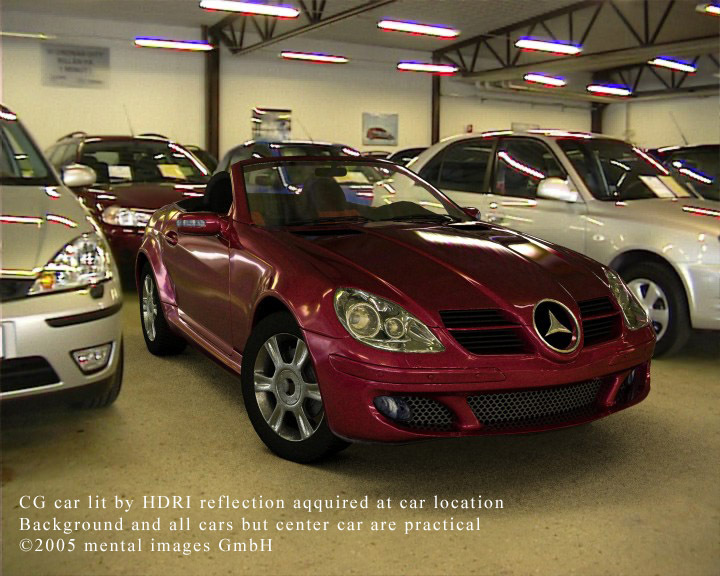 The glossy reflections are created with the help of the shader mib_glossy_reflection. Therefore, the parameters max_distance (limiting the reach of reflective rays) and single_env_sample (optimizing lookup of environment maps) are exposed parameters of that shader. Only a subset of the parameters are exposed. If more are required, one can either build a custom shading graph or create ones own variation of the mi_car_paint_phen Phenomenon. Real cars are rarely clean. 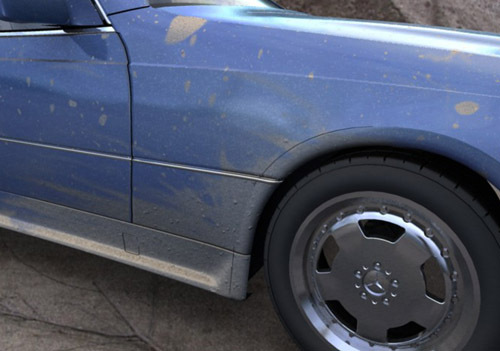 Here showing the dirt layer (hand painted dirt placement map), including a bump map applied in the dirty regions. A simple lambertian dirt layer covers the underlaying paint and clearcoat layers. is the color of said dirt. the amount of dirt, which would probably be connected to a texture shader to get variations in the dirt across the surface. If dirt_weight is 0.0 no dirt is added. is a global tuning parameter affecting the entire diffuse, flake and specular subsystems. It does not affect reflections or dirt. 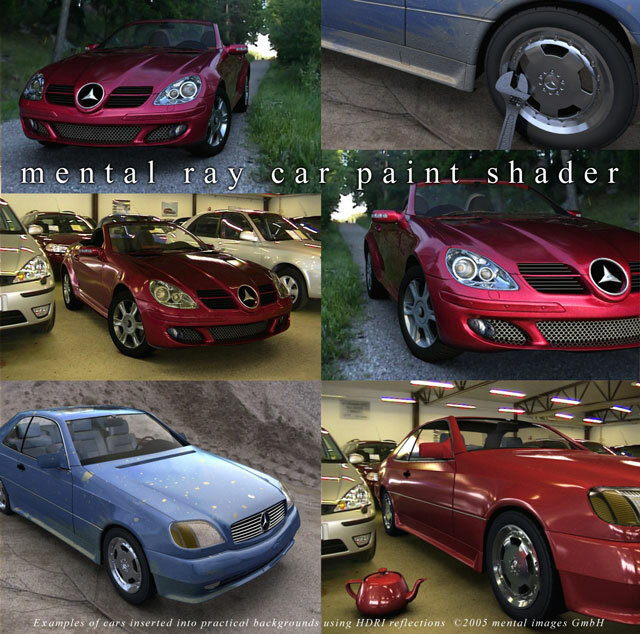 The mi_metallic_paint is shader is used to facilitate the rendering of metallic paint. 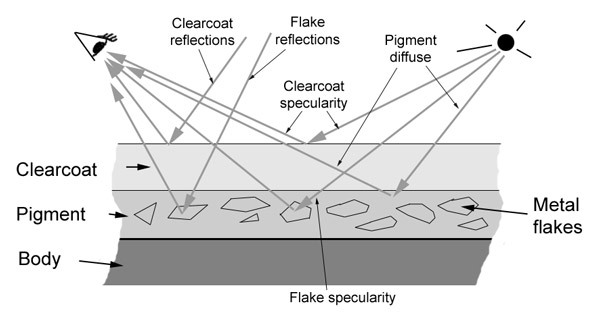 However, it only takes care of the pigmentation and the flakes, not the very important clearcoat reflections. To accomplish the full effect, it needs to be combined with a reflection shader (i.e. connecting it to the base_material parameter of mib_glossy_reflection). It also needs a bump shader for the flakes (generally mi_bump_flakes). 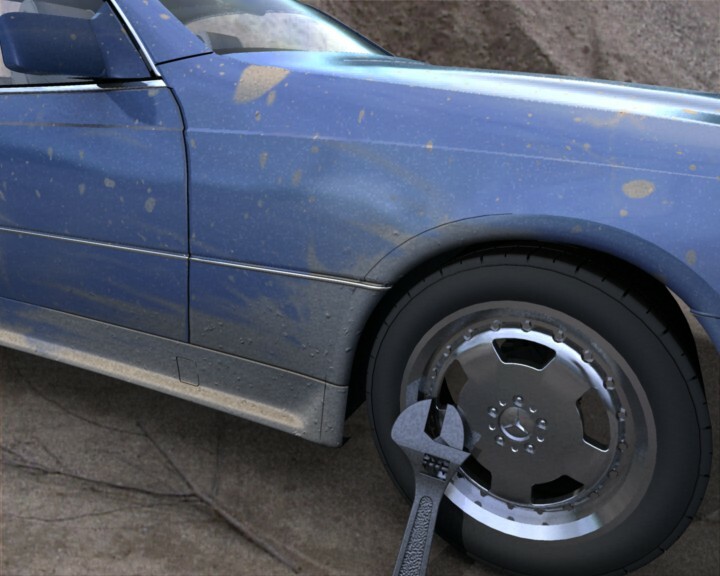 To get all these connections made automatically one can use the ready-made Phenomenon mi_car_paint_phen, which also supports a dirt layer. See the above documentation, which has slightly more detailed documentation of the parameters with example images. allows to tune the overall level of the diffuse parameters. is the actual flake bump shader used. The shader mi_bump_flakes exists for this purpose, but any shader that modifies the normal vector (e.g. mib_passthrough_bump_map) can be used. The shader put in the flake_bump may also return a color, which will be the color (intensity) of the flake, or it may leave the color unmodified. Since flakes are inherently small, they can easily introduce rendering artifacts if their visual density becomes significantly smaller than a pixel. To avoid this the parameter flake_decay exists. It sets a distance at which the influence of flakes fade out. A value of 0.0 disables fading. Any positive value causes the flake_weight to be modulated such that it reaches zero at this distance. is a global tuning parameter that is a global multiplier to the output of the shader. 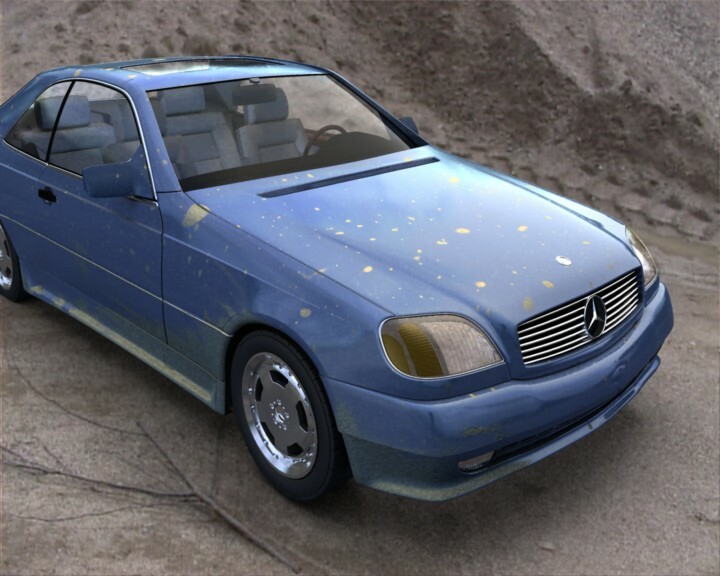 This shader is designed to create a bump map with the appearance of small individual flakes at slightly different orientations. It does so by slightly modifying the current normal vector based on a procedurally generated flake texture. It also returns a color that indicates the "intensity" for that flake. only affects the returned color, not the amount of change to the normal vector. The useful range is from 0.1 to approximately 10.0, where lower values indicate less dense flakes (more flakes are given low color values near black) and higher values indicates denser flakes. indicates the amount of normal vector perturbations. Useful range is 0.0 (which disables the effect) to 1.0. For low values, flakes are nearly parallell, for higher values, the difference between each flakes orientation is larger.